Common in marshes. Also in calcareous fens, moist meadows, and along streams and shores. Most of the U.S. and Canada but absent from some states in the southeast. Herbaceous perennial to a little under 1 m tall. Leaves opposite, short-petiolate, glabrous to hairy, serrate, acuminate. Flowers white to purple or pink, from the axils of the upper leaves; calyx pubescent. This our only native member of this genus. 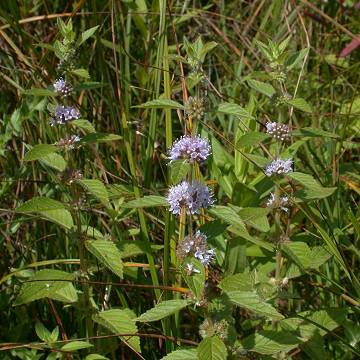 The plants pictured here are Mentha arvensis var. villosa (Benth.) S. R. Stewart. National Plant Data Center, Baton Rouge, LA 70874-4490 USA.